Discover our female anti-hair loss routine: an ideal routine to act against occasional hair loss (caused by stress, fatigue, post-pregnancy, changing seasons, etc.) in women. 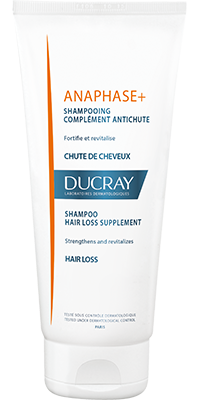 Personalize your routine: for each step, choose the Ducray products that best suit your type of hair loss. Shampoo to complement all anti-hair loss treatments. Strengthens your hair and adds volume. 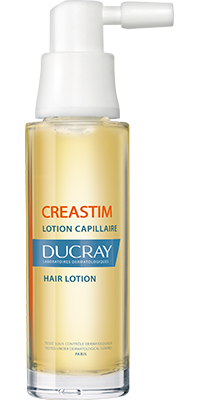 Creastim Lotion solves the problems of occasional female hair loss, often caused by stress, changing seasons, fatigue or post-pregnancy. It is suited to young mothers. Apply 3 times a week for 2 months. 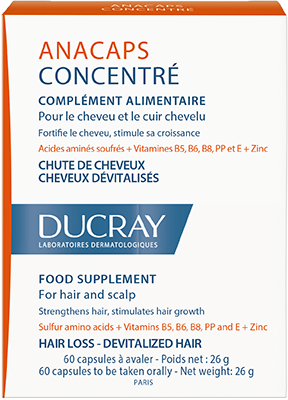 Anacaps Concentrate is a vitamin-enriched food supplement that effectively fights hair loss and leaves hair and nails stronger.